It starts with a dress, well wedding inspiration usually starts with the bridal dress or sometimes the spark of an idea . I started with this dress which inspired a sophisticated theme of old hollywood style glamour. I love this glamorous dress by Christine Fox at Wedding Belles Bridal Studio. It’s reminiscent of Hollywood times gone by, Audrey Hepburn, sophisticated parties and fabulous clothes. The Wedding Belles Bridal Studio is based in Great Moor, Stockport. It specialises in creating individual and unique wedding dresses and accessories. As well as offering a semi couture collection of bridal gowns that can be personalised. The classic lines of this dress and the ruched bodice ooze glamour. What could be more perfect than a glameria bouquet with this dress? Glamerias are made from lots of rose petals skilfully arranged into one large rose. This bouquet feature red rose petals, although they can also be made with lilies. It is edged with a collar of skeletonised leaves. Crystals dotted throughout the bouquet or a crystal collar could also be incorporated to tie in with the crystal detail at the waist of the dress. I would love to see ruby red shoes peeking from under this dress. I’ve picked red to go with this dress as a colour scheme as it is a classic colour and gives a very chic look. Think red lipstick, classic glamour and sophistication. Red used with diamantes and faux crystals looks even more luxurious. Touches of black could also be added to give the colour scheme a slightly more dramatic look. To carry the glamorous look throughout the rest of the wedding you could serve guests their welcome drinks in martini glasses with a strawberry on the side. The top table could have small tank vases filled with red roses along the length of the table. With rose petals and large faux crystals scattered in between the vases. A star cloth hung behind the top table would give added star quality to the look and looks fabulous when you turn the lights down in the evening. 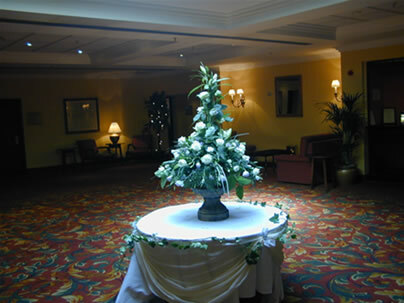 For luxurious table centres, large cocktail arrangements of red roses and gerberas grouped with frothy fern and crystals in tall martini vases would look fabulous. Rose petals and crystals scattered around the arrangement complete the look. A swing band would be the perfect accompaniment to this theme and a black and white checkered dance floor would also be a chic touch. There are lots of resources available on the internet for this look if you need any more inspiration. The Gerbera is a very popular cut flower. It is loved for it’s daisy like appearance and the wonderful colours it comes in. 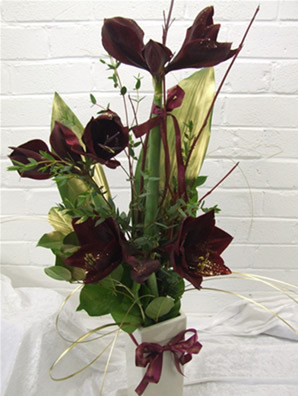 It has a contemporary look with its simple flower head and leafless stem. Gerberas were discovered in South Africa and brought to the UK in the 1800s, named after the German naturalist Traugott Gerber. They are the fifth most popular flower sold at the Dutch flower auctions and available all year round. 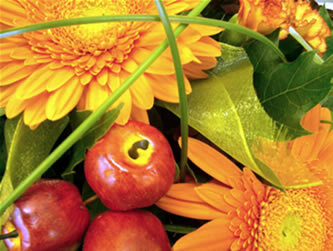 Gerberas are cultivated all over the world and there are now over 200 varieties. Each with their own name. A few of them are spongebob a yellowy pom pom variety, Serena a vibrant cerise colour and kimsey a pale pink germini. There are several types of gerbera including double petalled flowers, spider gerberas and frilly petalled varieties. Mini gerberas or germinis are also popular especially with florists as they are perfect for using in smaller arrangements. Gerberas come in every colour imaginable apart from blue. From white and creams, through to pinks, red and oranges. There are even some terracotta colours gerberas. The bright colours are very popular as cut flowers for the home, but most florists usually stock an assortment of colours. Gerberas have a vase life between 4-14 days. The conditions they are kept in will greatly affect their longevity. 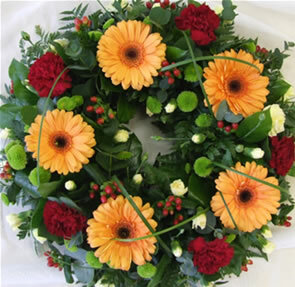 Gerberas from a florist will be properly conditioned before sold which also helps them to last better. Often the stems are wired, this is important because when they are transported from growers out of water the stems become flaccid, but once gerberas start to take up water they become turgid. At this point the flower head will set in that position so it needs to start in an upright position. They are also very sensitive to bacteria so vases should always be properly cleaned before use with gerbera and flower food added to the water. I use gerberas in all aspects of work, the large gerberas are good value as the heads are so big while germinis are perfect for smaller work where a large gerbera might look out of place. As they come in such a vast array of colours there is always a gerbera to match the look you are trying to achieve. The vibrant gerberas in hot pinks and oranges are perfect for exotic looking themes. While the pale pastel shades such as bridal Kimsey, a very pink germini are beautiful in wedding work.